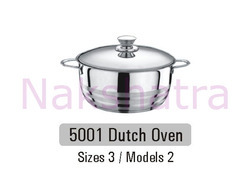 We are a leading manufacturer and exporter of able range of Dutch Ovens. Manufactured using premium quality stainless steel these products are polished flawlessly to offer a mesmerizing look. These ovens are appreciated for their look, usability and better performance and quality. Products offered by us are quality tested by our expert quality analysts to meet international quality standards. Size: 16, 18, 20, 22, 24 Cm. : Size: 20, 21, 23, 24, 27 Cm. 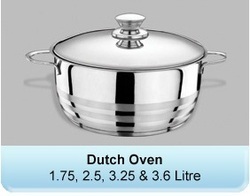 We are the manufacturer and supplier of wide array of Dutch Oven for Home Decor. To meet the diverse requirements of customers, we offer these products in various designs and sizes. - Size : 16, 18, 20, 22, 24 cm. Stainless Steel Easy to clean keeps fine bright outlook Easy to serve & Easy to hold Rust proof & Hygienic. - Case Pack: 12 pcs.